Club Golf D’Aro Mas Nou has underlined its commitment to preserving the stunning Costa Brava environment with a new fleet of eco-friendly buggies. The spectacular course – one of seven outstanding venues in the province of Girona – enjoys a lofty position 300m above sea level with incredible views from the Gavarres mountains and down towards the resort of Platjo D’Aro and the Costa Brava coastline. 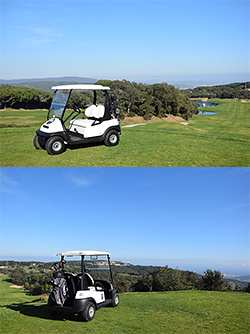 And while it is a memorable trip up the mountain to even reach the course, the journey around the challenging 18 holes just got a whole lot easier as part of an ongoing upgrade at the club with 33 brand new buggies available to hire for €48 per round. The new Club Cars are high-quality, noiseless, and electric-powered to cover the high season demand and will reduce the carbon footprint. In addition, for those keen to walk the course and take in more of those extraordinary views, the electric trolleys have also been upgraded with new lithium batteries throughout the range. It’s just the latest commitment from D’Aro, which was also awarded the GEO Foundation certificate for its environmental sustainability last year and is now completely irrigated with treated wastewater. It has also seen the local wildlife population flourish with several rare species of birds returning to the site in recent times. The Costa Brava Tourist Board offers golfers the opportunity to enjoy outstanding golf all year-round in one of the most beautiful and unspoilt natural environments in Spain and Southern Europe. Situated 100 kilometres north of Barcelona in a region nestling between the foothills of the Pyrenees and the waters of the Mediterranean, the Costa Brava boasts an array of first-class golf experiences, and the association features seven golf clubs and nine varied layouts from some of the game’s most well-known and accomplished designers. The coastal region of the province of Girona, the Costa Brava (which translates as “wild coast” in English) features of 214 km of spectacular and captivating coastline running between Blanes in the south and the French border in the north. One of Catalonia’s principal tourist centres, the area enjoys average annual temperatures of 16.5Cᵒ has everything needed for an unforgettable stay; from outstanding nature, beaches and forests to unforgettable culture, history, gastronomy and art, many of which enjoy international recognition.